President Donald Trump says he “trusts” North Korean leader Kim Jong Un, despite the fact that “nobody really knows” if the regime is actively building up its weapons arsenal. During an interview with CBS’ 60 Minutes which aired Sunday night, interviewer Lesley Stahl pressed Trump over his relationship with Kim in the months since their June summit. Trump also said that he and Kim have “good chemistry” together. Trump added that he is not easing sanctions on North Korea, despite the regime’s continued appeals. During an interview with CBS’ “60 Minutes” which aired Sunday night, interviewer Lesley Stahl pressed Trump over his relationship with Kim in the months since their June summit. “We were going to war with North Korea. Now, you don’t hear that,” he said, boasting of the progress made with Kim since their initial meeting. 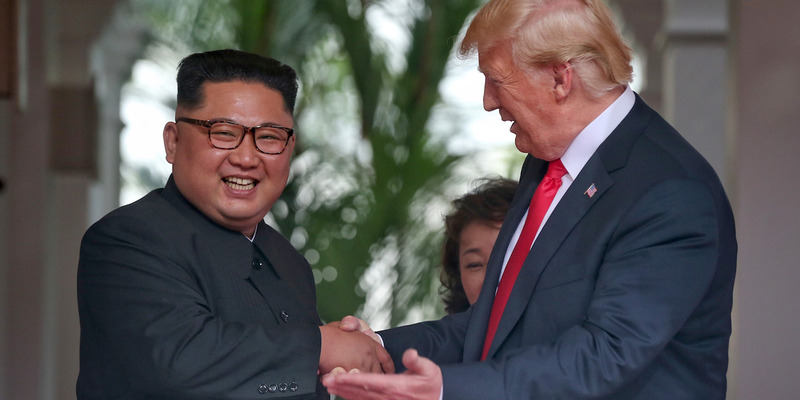 “And he doesn’t wanna go to war, and we don’t wanna go to war, and he understands denuclearization and he’s agreed to it. And you see that, he’s agreed to it. No missiles,” he said. “I do trust him, yeah, I trust him. That doesn’t mean I can’t be proven wrong,” Trump added. When asked about reports that Kim appeared to be continuing to build up his weapons arsenal despite pledges to denuclearize and ease tensions on the Korean Peninsula, Trump came to the young leader’s defence. “Nobody really knows. I mean, people are saying that. I’ve actually said that,” he said. Stahl also pushed Trump to elaborate over his previous statements in which he claimed that he and Kim “fell in love” through their correspondence. Stahl stressed that Kim has been widely criticised for the cruel treatment of his people, 10% of whom have been forced into modern slavery used to prop up the repressive regime, and many of whom live in extreme poverty. “He presides over a cruel kingdom of repression, gulags, starvation … slave labour, public executions,” she said. “This is a guy you love?” she asked Trump. “Let it be whatever it is. I get along with him really well. I have a good energy with him. I have a good chemistry with him.’ he said. Still, Trump said he is not easing sanctions on North Korea, despite the regime’s continued appeals. North and South Korea are currently holding high-level talks at the “truce village” along the country’s border to discuss implementing a peace agreement between Kim Jong Un and South Korean President Moon Jae-In. Moon told a French newspaper on Sunday that Kim is “sincere” in his promise to give up the country’s nuclear weapons, and urged the international community to “reward” him for his efforts. Still, the US has said it is waiting for concrete action, including the “permanent” and “irreversible” dismantling of North Korea’s nuclear facilities, before the US would concede.